Tonight was grocery night. It had been two weeks since we had been to the store, and we were running out of a few things. Also, the pantry was starting to look a little bare. My husband gets home around 4:30, and I really wanted to beat that 6:00 rush at my local Aldi, so I knew I needed to have something on the table fast! But, just because you have to have a meal on the table fast, doesn't mean you have to cut the corners of filling and flavorful food! I have a perfect 20 minute meal that will hit the spot and everyone is sure to love! every ONE cup of rice. Lower to a simmer, cover, and set a timer for 15 minutes. Add a couple tablespoons of oil to your sauce pan and heat. When your pan is hot, add your smoked sausage. You are going to let that go until it browns and caramelizes a little. Next you will add your onion, peppers, and garlic. Let that cook till they are soft and the onion is translucent. 2-3 minutes. As well as your tomatoes. Now add your salt, pepper, oregano, and Cajun seasoning. If you don't want it to be spicy, omit the Cajun seasoning. If you want it REALLY spicy, add more! It is entirely up to you! Bring to a simmer, cover, and let it go for 15 minutes. Your beans and rice should finish about the same time, plate it up, and serve! Delicious! 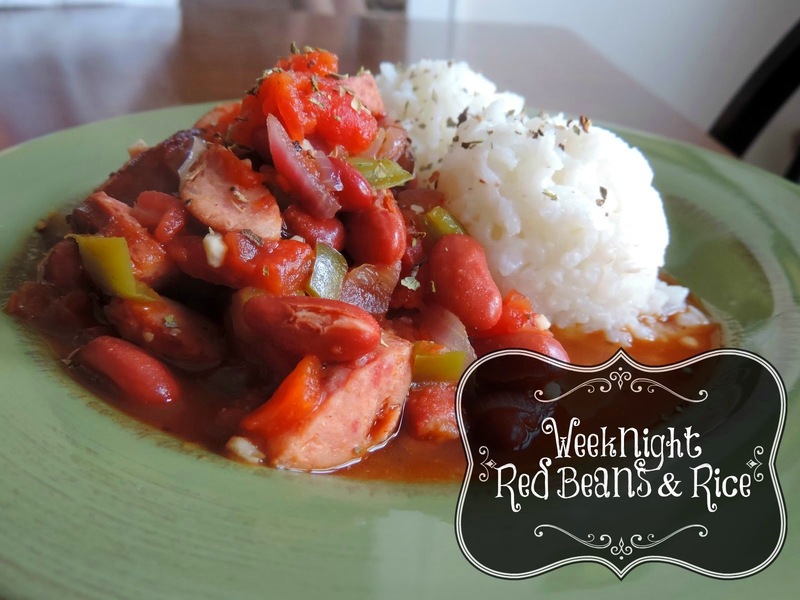 What makes this red beans and rice recipe so quick is the use of canned beans. Listen, IT'S OKAY TO USE CANNED BEANS!!! If your granny would have had canned beans, she would have used them too. The result is a wonderful meal, ready in 20 minutes, that tastes like it simmered all day! Bring your water to a boil in a sauce pan. Add your rice, lower to a simmer, and cover. For your beans, add 2-3 tbsp. of oil to other sauce pan. When pan is hot, add sausage and allow to brown. When sausage has browned, add onion, green pepper, and garlic. Next add your beans and tomatoes, liquid and all. Add your salt and pepper to taste, along with your oregano and Cajun seasoning. Stir, bring to a simmer, cover, and let cook for 15-20 minutes. Plate your rice and your beans and serve!